There are always things to do in Marvellous Melbourne all year round! Sports Is A Way Of Life In Melbourne! A Small-City Feel In A Big Modern Metropolis! A city that always has something up its sleeve, Melbourne sits on the banks of the Yarra River. A liberal supporter of fine arts, the city has a thriving art and cultural scene. Known during the Aboriginal days as Kulin nation and later Europeanised to become Melbourne, there are multiple facets to the city, each with their unique rich history. One of the top things to do in Melbourne is a drive down the Great Ocean Road. One of the best drives, the Great Ocean Road winds alongside the Southern Ocean. 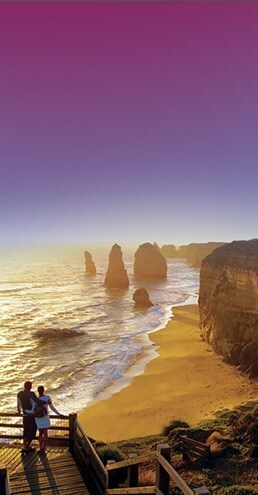 Near the coast is the iconic 12 Apostles, which are limestone spires that rise majestically from the ocean. Go on a scenic flight tour and see the entire Shipwreck Coast, as well as Australia's oldest lighthouse at Cape Otway. Phillip Island is another nearby destination that gets a lot of visitors. Melbournians always have something going on in their city with a year-round packed program of festivals and events, from sports to arts. Open spaces are another highlight of the city, with the Federation Square at the top of this list. Melbourne’s main meeting place, Fed Square is one of the most visited attractions in the city, where art meets architecture. The exciting array of bars and restaurants in the vicinity, further makes this place an attractive proposition for an evening soiree. With over 140 cultures, including those of indigenous and migrant population, in Melbourne, you can see tell-tale signs of their impact across the city. A one-stop place to experience all this is the Laneways, where the city's true nature resides. Laden with surprises, Melbourne’s Laneways hold many hidden treasures with covert boutiques and hole-in-the-wall cafes. Appreciate fine examples of street art and pre-war architecture, as you saunter along the narrow pathways with a choice drink in hand. Get a Melbourne Attractions Pass to visit and experience most of the highlights of the city. The Observation Wheel in the Docklands offers a bird’s eye view of the city during a 30-minute ride. Visit the Royal Botanic Gardens, located right in the middle of the city, having over 12,000 species of plants and a sanctuary for native wildlife. St Kilda’s is another great place to head, if you have kids in tow. Explore what’s on in Melbourne and experience everything the city has to offer! What began with fledgling roots in 1835, Melbourne is now a vibrant global city and a world leader in many fronts. Melbourne officially came into existence in 1851, and became the capital when Victoria separated from New South Wales. By 1860, Melbourne city started to take form, retaining some original sections to maintain its uniqueness. The city slowly entrenched its roots in history and is definitely here to stay. With the migrant population being mostly Christian, there are lots of churches in the city, showcasing the magnificent architecture of yore. These timeless stone structures form one of the many heritage structures of Melbourne. The Gold Rush resulted in mass migration to Melbourne, which led to the building of Victoria Dock in the Docklands. There was a sharp rise in the population of the city during this period, which led to the development of the transportation system. By 1887, about 32km of electric tramway was laid. The city suffered a lull in the 1930s, with global events like the Great Depression and World War II, but it picked up in the 50s and 60s. Melbourne’s CBD or Central Business District was the highlight of this economic boom, with many skyscrapers coming up. The 1956 Olympic Games further brought international renown to the city, and Melbourne started to evolve as a global destination. The erstwhile Victoria Dock turned out to be Melbourne’s hippest place, and the Docklands became the city’s urban waterfront and a go-to destination for locals and tourists alike. There are many forms of transportation options available in Melbourne. The city is cyclist-friendly with over 135km of well-developed cycling routes. You can hire a cycle for the day, with the Melbourne Bike Share public bicycle share scheme. If you seek more conventional transportation means, the city has a healthy network of trains, trams and buses. There's also the free City Circle Tram that touches all of Melbourne’s main attractions. Motorised wheelchairs can be hired through Travellers Aid or Automobility. Avail the services of a myki smart card and top up as you explore the city. Getting to and from the airport is very simple, with taxis available in plenty. The rates are printed inside the cabs and be sure to get receipts, so you can track the vehicle in case you misplace something. Skybus operates a 24-hour shuttle bus service between the city and the airport, with the journey taking 25 minutes. If you are travelling by your own convenience, there are over 70,000 safe parking spots available in many convenient locations around the city. The city of Melbourne tries to make your visit as hassle-free as possible. Tourists from other nations can download guides in their own language. There’s Chinese, French, German, Italian, Japanese, Korean and Spanish. Download the handy national public toilet map and you can find the nearest restroom close by. Head to the Melbourne Visitor Centre at Federation Square for all assistance, on what to see and where to go in Melbourne. They point you in the right direction and also arm you with the right brochures and maps, so you won’t be wasting time deciding what to do. There are other kiosks conveniently placed at key locations, like the Melbourne Visitor Booth (Bourke Street Mall), Fitzroy Gardens Visitor Centre and City Ambassadors (Swanston Street). A hotspot for antique memorabilia, from music vinyls to local artwork, seek and ye shall find in Melbourne. Bid goodbye to the city, carrying more than just memories. Find souvenirs of all shapes and sizes, from antiques to memorabilia. Shops are usually open by 9am and close by 6 or 7pm throughout the week. Most shops will be closed on public holidays. Prints, homeware and accessories are a dime-a-dozen, and you can score some sweet deals at the markets. Music enthusiasts will be especially pleased with the treasure trove of record stores that should satisfy the cravings of all genres of music fans. Call 000 from a phone for all emergencies while in Melbourne and you should receive immediate attention. The sun is something to look out for here and it takes just 15 minutes for your skin to burn. Arm yourself with all things anti-sun – sunscreen, sun-hat and sunglasses, before venturing out! Emergency medical services can be availed in Melbourne at the hospitals listed below. One of the oldest and reputed hospitals in the country, the RMH offers medical assistance for adults. This hospital does not cater for childbirth or provide children's medical services. The best children’s hospital in the state of Victoria, all emergencies can be handled here. Mexican, Chinese, Spanish, Italian, and Korean to name a few, Melbourne is truly international in its cuisine repertoire. The rich migrant population of the city makes sure food from all nooks and corners of the world are available here at all times. With close proximity to the seaside, fresh seafood is plenty and is done the traditional Aussie way – thrown on the barbeque. Accompanied with some local beer or wine, you just may have found heaven! Find a place to crash for all price ranges, from dorm rooms to luxury well-appointed hotel rooms. Choose from the variety of accommodation options, including a variety of decent stay options for backpackers. For those with deeper pockets and looking for upgrades, fret not; you can get your money’s worth, with hotel rooms that have splendid views to wake up to every morning during your stay.